1995-05-09. New. Ships with Tracking Number! INTERNATIONAL WORLDWIDE Shipping available. Buy with confidence, excellent customer service! 1996-08-07. New. Ships with Tracking Number! INTERNATIONAL WORLDWIDE Shipping available. Buy with confidence, excellent customer service! Random House Audio. Used - Very Good. Very Good condition. Audio Cassette. Case Good. Slipcase Good. 2 cassettes. Abridged edition. Quality guaranteed! In original artwork/packaging unless otherwise noted. 1999-09-14. Good. Ships with Tracking Number! INTERNATIONAL WORLDWIDE Shipping available. May not contain Access Codes or Supplements. May be ex-library. Shipping & Handling by region. Buy with confidence, excellent customer service! 1996-02-02. New. Ships with Tracking Number! INTERNATIONAL WORLDWIDE Shipping available. Buy with confidence, excellent customer service! Hodder & Stoughton. Used - Very Good. Very Good condition. G K Hall & Co. Hardcover. 0783801203 New Condition. . New. G K Hall & Co. Hardcover. 0783801203 Like New Condition. . Fine. Hodder & Stoughton. PAPERBACK. 0340637870 New Condition. . New. Nan A. Talese. PAPERBACK. 0385418485 New Condition. . New. Anchor. PAPERBACK. 0385418493 New Condition. . New. 1996-08-07. Good. Ships with Tracking Number! INTERNATIONAL WORLDWIDE Shipping available. May not contain Access Codes or Supplements. May be ex-library. Shipping & Handling by region. Buy with confidence, excellent customer service! Nan A. Talese, 1995-02-15. Paperback. Like New. Stated First edition, first printing, full number line. Appears unread, minor shelf and/or handling wear.. Unconditional money back guarantee. ANCHOR. New. 8.16 x 5.32 cm. Hodder & Stoughton. PAPERBACK. 0340637870 Like New Condition. . Fine. Nan A. Talese. PAPERBACK. 0385418485 Like New Condition. . Fine. Anchor. PAPERBACK. 0385418493 Like New Condition. . Fine. G K Hall & Co, 1998-05. Hardcover. Good. Nan A. Talese, 1995. 1st Edition 1st Printing. Soft cover. New/New. 8vo - over 7¾ - 9¾" tall. 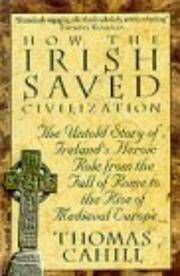 Stated First Edition, First Printing with full number line to 1-" Every year millions of Americans celebrate St. Patrick's Day, but they may not be aware of how great an influence St. Patrick was on the subsequent history of civilization. Not only did he bring Christianity to Ireland, he instilled a sense of literacy and learning that would create the conditions that allowed Ireland to become "the isle of saints and scholars" -- and thus preserve Western culture while Europe was being overrun by barbarians. In this entertaining and compelling narrative, Thomas Cahill tells the story of how Europe evolved from the classical age of Rome to the medieval era. Without Ireland, the transition could not have taken place. Not only did Irish monks and scribes maintain the very record of Western civilization -- copying manuscripts of Greek and Latin writers, both pagan and Christian, while libraries and learning on the continent were forever lost -- they brought their uniquely Irish world-view to the task. As Cahill delightfully illustrates, so much of the liveliness we associate with medieval culture has its roots in Ireland. When the seeds of culture were replanted on the European continent, it was from Ireland that they were germinated. In the tradition of Barbara Tuchman's A Distant Mirror, How The Irish Saved Civilization reconstructs an era that few know about but which is central to understanding our past and our cultural heritage. But it conveys its knowledge with a winking wit that aptly captures the sensibility of the unsung Irish who relaunched civilization. Anchor, 1996-02-01. Paperback. Very Good. Nice looking book, has minor edge wear. Anchor. PAPERBACK. 0385418493 Artwork or packaging may show signs of wear or damage and may have notations or highlighting. Super-fast Shipping. Satisfaction Guaranteed. . Good. Nan A. Talese, 1995-02-15. Hardcover. Used:Good. G K Hall & Co. Used - Good. Former Library book. Shows some signs of wear, and may have some markings on the inside. USA : DOUBLEDAY, 1995. 1ST EDITION. HARDCOVER. NEAR FINE/FINE. USA : DOUBLEDAY, 1995. 1ST EDITION. NEAR FINE/FINE. New York, New York, U.S.A.: Doubleday, 1995. Hardcover. Book Condition: Near Fine. Dust Jacket Condition: Fine 1st Edition, later print, gift inscription opposite title page, not remaindered or book club or library, mylar cover, unclipped jacket, appears unread. New York: Doubleday, 1995. Fine. Advance Reading Copy. Fine in printed wrappers. Nan A. Talese. PAPERBACK. 0385418485 Hardcover. First Edition - First Printing. Full Number Line. Near fine / near fine dust jacket. Free of any markings and no writing. For Additional Information or pictures, Please Inquire. . Fine. Anchor, 1996-02-01. Paperback. Used:Good. In Stock. Always but with confidence. Anchor. PAPERBACK. 0385418493 Brand New ,Original Book , Direct from Source , Express 5-8 Business days worldwide Delivery. . New. Anchor Books. Politics & History. New. Hinges of History Brand New: This item is brand new unopened, never used and still in its original manufacturer condition. Anchor, March 1996. Paper Back. New. Anchor. PAPERBACK. 0385418493 Special order direct from the distributor . New. Anchor. PAPERBACK. 0385418493 Remainder mark . Fine. New York: Doubleday, 1995 Very minor edge wear on the spine.Book is unread.On cover states"Bound Galley Not for Sale".. First Edition. Trade Paperback. Fine/No Jacket. 8vo - over 7¾" - 9¾" tall. Advanced Reading Copy (ARC). Anchor. PAPERBACK. 0385418493 . New. Anchor. PAPERBACK. 0385418493 signs of little wear on the cover. . Very Good.